So You Think You Can Mom? 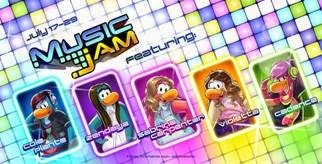 : Club Penguin Launches Music Jam Event! Club Penguin Launches Music Jam Event! Disney Club Penguin today launches its annual Music Jam event, letting players rock out alongside penguins inspired by players’ favorite Disney music stars. In the Music Jam event, players can watch their favorite artists perform on the all-new musical cruise ship, and then make music with the new SoundStudio. While on the Music Jam cruise, players will be able check out performances from DJ Cole Plante, Zendaya, Sabrina Carpenter, Violetta and Cadence on the cruise’s main stage, eat at the buffet, stomp out rhythms together in the Engine room and watch as day turns to night on-board. With the new SoundStudio, all players can make unique music mixes. Members will be able to save their music creations and share them with others in the Dance Club where all players can ‘like’ the music.